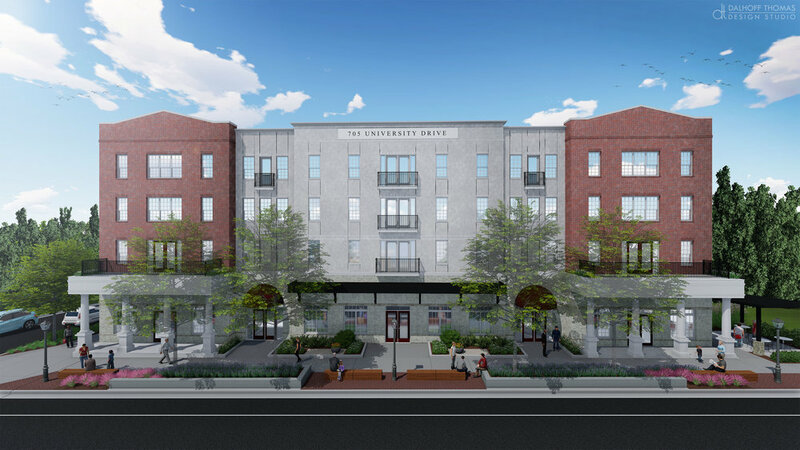 DESCRIPTION - The Vista is state-of-the-art student living located in the historic Cotton District of Starkville, MS, home of Mississippi State University. DT Design teamed up with architect Niles Bolton Associates and engineer TTL to design this mixed-use urban infill development. The site amenities include a pedestrian plaza with ground-floor retail on University Drive, a central pool and outdoor kitchen, and a dog park. DT Design worked with manufacturers and the City of Starkville to ensure that the new streetscape will blend with existing materials while bringing a fresh, contemporary feel to the area. This project is set to complete construction summer of 2019. For more information, please see the video below from Niles Bolton Associates.